PENITAS — The first group of medical students at the University of Texas Rio Grande Valley have taken upon themselves to start the first student-run clinic in the region with a focus on supplying health care to the Valley’s poorest. Mahler is part of the inaugural cohort of UTRGV medical students that began their studies here in 2016. The class worked together to structure the project, pick a location, and held elections to select a five-member board that would lead the project, which Mahler is a part of along with Nery Guerrero, Joseph Boateng, Sravan Narapureddy and Joy Alvarado. The team has done everything from grant writing, to connecting with community partners and developing a model that not only provides free health care to underserved communities, but that is sustainable and can be replicated by future cohorts. Choosing a location wasn’t easy considering there are more than 900 colonias in Hidalgo County alone. They initially selected from areas where there was already some sort of community effort to provide health-related services, but where help from physicians was still needed. That’s how Peñitas was identified as the university had already been working with Proyecto Desarrollo Humano, a local nonprofit organization that offers wellness-related services, to provide some health screenings and other services through UTRGV’s mobile clinics. The nonprofit and the university signed a memorandum of understanding in which Proyecto Desarrollo Humano will provide space free of charge for the clinic. The students will start by opening the clinic once a month at the nonprofit, located on 17617 Sabal Palm Dr., and they will have between 15 and 20 student volunteers providing health services while being overseen by two to three faculty members, said Dr. Linda Nelson, senior director of clinical operations at UTRGV. Nelson is one of the UTRGV faculty mentoring the students in some areas of the medical enterprise, but she said they are the sole decision makers of the project. During the summer of 2017, the students coordinated focus groups with area residents and organization leaders in order to hear the community on the services most needed. They concluded that basic health screening was needed considering the nearest clinic is more than 20 miles away and many of these people shy away from seeking preventative care due to poverty or lack of legal status in the United States. Santiago said a large portion of the area population is at high risk for diabetes or has already developed the disease, and even as they try to guide them to healthier lifestyle free medical attention is key to keep these and other diseases at bay or under control. To their knowledge, this is the first student-run clinic to be set up in a colonia in the state, the students said, and they hope that in the future this becomes a model to follow so other students can make their mark in underserved areas. Boateng and the team gleamed with excitement to be the ones to establish this service in one of the most underserved communities in the area. 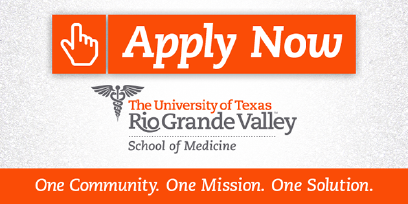 This is an opportunity, they said, that is unique to UTRGV considering the school of medicine is still in its start-up phase and the unique challenges presented to them in a border region. This direct interaction with the community is what these students hope will give them a better understanding of a patient as a whole as they don’t only get to worry about what the patient told them during examination but they get to see and experience the conditions they live in and the socio-economic hurdles they face on a daily basis. “It’s been said that medical training actually happens in classrooms, but interaction with the community is what actually develops the soul of the physician,” Boateng said.